I'm looking into making some things inside for the rainy part or fall and the coldest part of winter. Since I'm new to the wintery north, I figured that I needed to start making quilts again. Honestly the only one that I've ever made was when I was in high school with my Mom. I loved using the fabrics that meant something to me. Things that were used for projects and things that Mom or I used to wear. I have a photo of both of us wearing black velvet dresses that were used in the quilt ( I think I was 8?) When we made the quilt her black velvet dress was getting frayed and worn so she donated it to my quilt project. When I slept with it I always found myself rubbing the black velvet pieces. It reminded me of Mom and it still does. Even though I don't sleep with it. Now that I am older I don't use the twin sized quilt much anymore. There is no more fabric to make a matching one for my guest room beds. (hopefully one day, I will have boys in that room and we can finish the actual guest room.) Also, the backing is getting tattered and soon will need to be replaced. Until then, I continue with my quilting. I was going to work on my pinwheel quilts for now. But, I got a little nervous when I had trouble with the cutting wheel. So, I'm practiced my piecing by making 4 placemats for our house. They are yellow, red and blue. They should help the colors flow better in the kitchen and dining room area. Now I can move on to the blanket sized quilts. I picked out a pattern that looks fairly simple, and bought the required fabric. I am doing a blue, green and yellow motif with the 2 twins. I bought enough fabric to do two of them in matching, or at least mix and matching fabric. 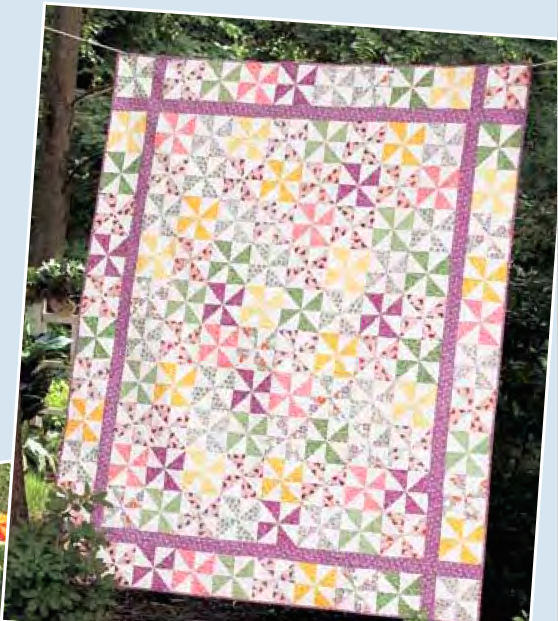 I do love the colors that they picked out for this quilt. But, I painted the room light blue. SoI want to try and keep with that theme. Plus, I'm envisioning it as a boys room. I also have found a good pattern for a quilt for my Mom for Christmas. (Although it's looking like it might not be done until NEXT Christmas.) She said she wanted, blue, gold, tan, or green and a tiny bit of red for options of colors. I eliminated the red completely. I couldn't see how I would add it at all. The gold is the backing and binding parts. The rest will be tan background and blue and green for the patterns. I am not going to show a picture as my Mom reads my blog. (Hi Mom!!) But, I am satisfied with the fabrics I picked for hers more than I am for mine. And as soon as I finish another project I am working on I am going to start cutting out my pieces. I hope to get a few photos of it when it is finished and some after I give it to her to share with you all dear readers. For my 2 twin quilts I found a pattern online for free that I am going to follow. Which you can find here. I am doing blue instead of violet that was used here. (I did not make this quilt.) But I think that it is going to turn out very well. I will be surprised when I finish it just as much as anyone else. A lady at the fabric store told me that quilting is fun, but you don't really know what it is going to look like until you are done. 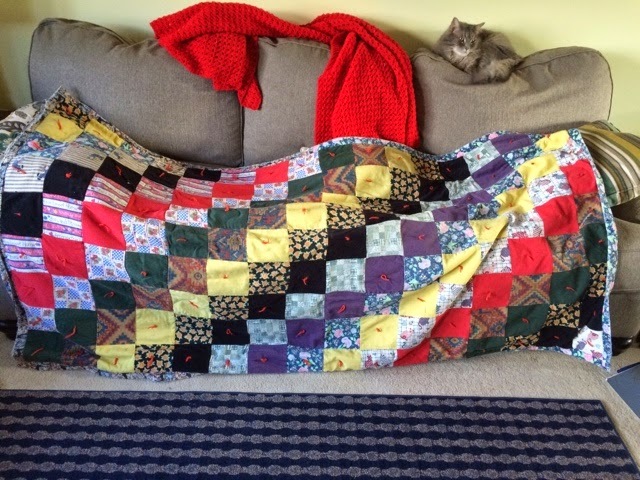 I think that is a strange way to sew, but I love quilts and I'm sure that mine will be cherished by myself and all who are warmed by them, if for no other reason than they do not have to sleep without a blanket. My DH seems to think that I should only have got enough for one project at a time. I figure this way I have less temptation at the fabric store. I did one trip and spent $250 and got almost enough material to make 4 quilts. Here's how: Mom's quilt is planned, the 2 twin guest quilts are planned, and I have extra materials that I could use for a scrappy quilt most likely for our room or a gift. I'm doing traditional styles and while I am not doing everything by hand, Amish quilts go of upwards of $800. I can make several quilts for that price.I figure that if they can do it, so can I. I am excited to start quilting more. We are going to need more quilts living in the great white north. Joining a community instead of checking out.